Application modernization is the repurposing of legacy software programming to align it more closely with current business needs. It is the key to success for businesses to stay competitive. While there are a number of challenges attached to it, the efficiency gained through this process helps companies to stay relevant and thus make it an absolute necessity. They need to transform their legacy apps and hence keeps the core business functions intact. At times, app modernization means transforming the apps themselves or the way they are maintained. However, there are various considerations for business altering technologies. A third party usually manages PaaS products. If a company chooses to use containers as a means of modernizing its legacy software, it will require container orchestrators or container management software to meet their goal. Contingent on the business needs, the application modernization services vary largely to help achieve digital transformation. In this article, you will come to know the best modernization approaches for your business. But first, let us discuss the best practices to adopt for app modernization. In this step, you will need to identify which legacy system will be modernized into an efficient Software as a Service Application. Both the operating system and servers are to be evaluated to run SaaS system. Make sure to consider the type of mobile devices to be incorporated to access the application and customize your plan accordingly. Another core part of modernization process includes finding how critical the data is being processed, moved and stored. Prioritize the importance of the data from high to moderate to low in order to help your team easily understand the significance of each data category. In this step, you need to find the threats of data loss by listing down the potential weaknesses and susceptibilities. After completing this step, you can prioritize the weaknesses and deploy security measures to eliminate them. The risk of being attacked by hackers needs to be considered by every business when modernizing legacy systems. It is, therefore, necessary to evaluate vulnerabilities related to your application. Through this process, you can classify high-risk areas and the influence that conceded security of your business. The greater the risk, the higher the negative impact a security breach could have. During software risk assessment, the closer the risk is to the value of one, the chances of susceptibility is greater. Applying data loss protection can help you to lower the risk and the amount of information loss. Make sure, to conduct a cost-benefit analysis and determine the ROI before opting out for the right tools. Thereafter, choose the right safeguard to integrate such as include stronger password and data encryption. 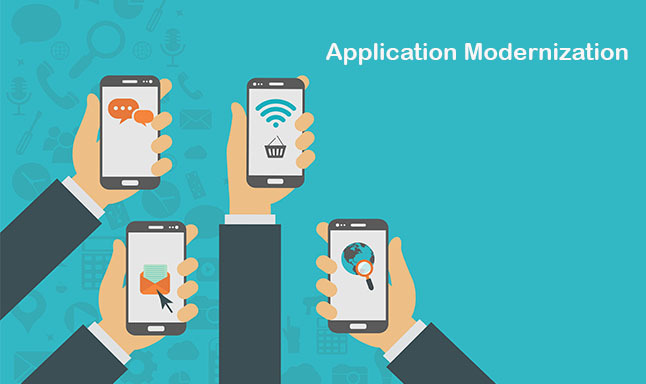 Now you have come to know the best practices to follow when opting for application modernization. It is time to look for best approaches for app modernization to suit your business. The approach for app modernization includes rebuilding new technologies while grounding off the old system. Everything begins from scratch, using standard platforms, or built using a third party package as a foundation layer. The approach is applicable in case of the current old system does not support innovative changes needed by the market or the underlying technology platform is no longer supported by the vendor. Complete transformation is best to adopt if the competitors are shifting to a less expensive stack while the vendors no longer support the current technology. Moreover, if the company want to build a new application with unified functionality, total transformation is the right approach. The approach is quite risky and the entire process is at stake, which could impact the business operations. Moreover, if the process fails in the midway, the cost is unbearable. It is considered as the best approach if done rightly, as it helps you to stay ahead of competitors. However, it is only suitable for the companies with required IT capability and maturity. In this app modernization approach, the component of an IT system is swapped with a new technology and shifted to production as a discrete application. The approach is less risky than the previous one as it requires transforming the entire system by moving one piece at a time. It does not require hefty cost as compared to total transformation. In addition, the functionality is moved one at a time, the impact of cost and failure is much lower. The gradual replacement approach requires lesser work than total transformation it consumes less management bandwidth. The approach allows companies to choose different technologies or newer version for later components. While following this approach, it helps explore ways of building ecological components or other objects for future applications. The drawbacks of gradual replacement come with amalgamation issues among different applications, if not managed properly. Moreover, if the architecture is not planned well, it may result in too many integrations and components. It can also lead to a set of disjoint applications that do not work as one unit. No matter, what the risks are associated with gradual replacement, the success rate is higher than any other approach. Local, small-scale changes are incorporated through new technologies to address specific issues in the application. However, the core architecture and technology remains the same. The approach is much suitable for companies focusing on current problems such as improving KPIs. It is also ideal for those companies facing the problem in the middle of the year when the budget is tight to opt for costly one. The duct tape approach for app modernization is ideal for small-scale changes with a greater return. It does not require hefty investment and can be supported through ad hoc budgets. The approach is less risky and does not require much attention of the management as compared to bigger transformations. The duct tape approach is associated with many risks such as the cost of multiple changes in an app. Moreover, the approach can lead to patchwork apps and bad design. While the approach is low on budget, management often overlooks the process without a thorough review. Despite being associated with many risks, the duct tape approach is the most common and successful approaches used with comparatively low investment. Despite what approach you adopt, app modernization is a complex, risky and labor-intensive process, but the results are well worth. Relying on the same outdated app might risk your business in the future. The quicker the adoption of technology, the better the results will be. You might not be able to handle the loss by not adopting the technological innovation.